I love pasta and it is a great way to make tasty side dishes for parties, showers, barbecues, and potluck meals. When I was trying to lose weight I had to modify my favorite pasta salad recipe into a Low Calorie Pasta Salad so I could still have a go to side dish. I find that this Low Calorie Pasta Salad was so easy to swap out with my normal calorie laden option that no one noticed my healthy swap. Now that my favorite pasta salad is Low Calorie, I am able to enjoy a serving without breaking my daily calorie bank or feeling like I need work out for an extra hour. A few simple tweaks made it a dish I could enjoy and feel happy serving my family and friends. Everyone is happy with the new changes and it is still requested for family gatherings, parties and more. Try this Low Calorie Pasta Salad at your next gathering and see if anyone notices that it is not laden with calories or fat. Cook Rotini Pasta according to directions. While the pasta is draining, dice onion into small pieces. Set Aside. Drain black olives and slice into small pieces and set aside. In a large bowl, combine pasta and Italian dressing. Stir pasta well making sure to coat all the past evenly. Mix in onions and Black Olives. Sprinkle McCormicks Salad Supreme on top of Pasta Salad and mix well. If you want to bulk up your Low Calorie Pasta Salad without adding extra calories so you can enjoy a larger serving , fill it up with these tasty Low Calorie options. 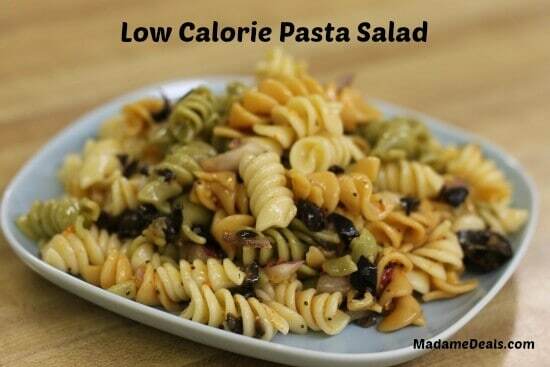 To prepare a complete Low Calorie Meal prepare this Low Calorie Pasta Salad with these tasty low calorie offerings. Share with us your ideas to make this Low Calorie Pasta Salad your own and let us know how it goes over at your next family party.